Photo: Tulsa Police Officer Leland Ashley was selected by Yates 12 years ago to lead a Police Athletic League before the position was eliminated. When Tulsa (OK) Police Major Travis Yates selected a Police Athletic League (PAL) Officer over a dozen years ago, he believed that it would make one of the biggest impacts on the community in the history of the agency. The department pulled the funding on the position and league before it could get started but Yates never stopped believing. “I paid close attention to the PAL programs across the country and I always knew that it was a perfect fit for my agency and community but the timing had to be right,” Yates told me in an exclusive interview. That timing was right in late 2014 when one of his officers approached him at the patrol division that Yates commanded. Sergeant Pat Harker approached Yates in the hallway and said he wanted to build a running track for officers in an open field in front of the division and that is when the failure to launch a Police Athletic League years ago came to his mind. An obstacle course and functional fitness area is just one aspect of the sports complex. Corporal Jason Muse quickly joined the discussions and Yates challenged both of them to develop several activities on the property and to make sure that those activities catered to members of the community with a special emphasis on kids. “Our patrol division serviced some of the most poor and crime ridden areas in the city and I knew this was a game changer. We, as a police department, could provide hope and opportunity to kids that often had none and if you can provide that, you can literally change a generation,” exclaimed Yates. The idea was not without it’s challenges. Yates had no funds for architecture plans and most around him thought the idea was too big to happen. Muse found an architect to lend his services for the cause and once the ideas went to paper, things got very real. “I’ll never forget the first time I saw images of what before was just in our head. As soon as I saw them, I knew this had to happen. This was too big and bold and quite frankly too cool to let it go away,” said Yates. A few months later, Yates got a call that would take the concept to the next level. The public park, located behind the division, had become a burden for the city so when officials found out about the proposed PAL idea, they called Yates and asked if he wanted the park. A local foundation found out about what the officers wanted to do and agreed to help raise funds for the project and as it stands right now, that initial concept is on the verge of being built. 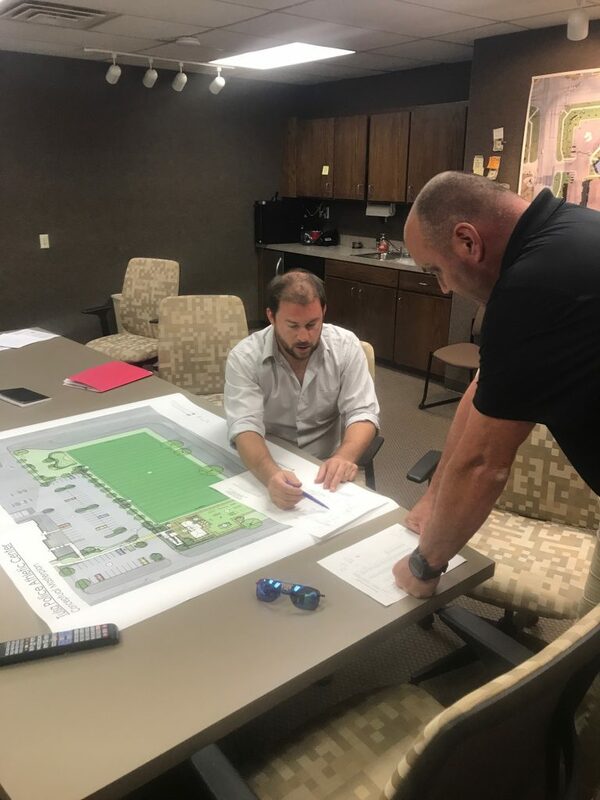 Tulsa Police Major Travis Yates (right) reviews plans for the multi-million dollar police sports complex. Yates says that there is a lot of work to be done, including putting the pieces together for what he now calls the Tulsa Police Activity League, but he credits his officers for the progress so far. Current plans include a baseball field, football field, tennis court, basketball court, obstacle course and yes, that running track but asked what he is most proud of, Yates lights up when he answers. What the Tulsa Police Department and Major Travis Yates is launching will be the first of it’s kind. A multi-million dollar sports complex owned and operated by a police department that is located just outside a police station. It is so big and so bold, it is almost hard to believe but one thing I know, is that if it can be done, it’s in good hands with Major Travis Yates. Randy Sutton is a 33-year law enforcement veteran and the national spokesman for the American Council on Public Safety (www.defendingtheshield.org). He served 10 years in the Princeton (N.J.) Police Department and 23 years with the Las Vegas Metropolitan Police Department, retiring at the rank of Lieutenant with numerous awards for valor, lifesaving, community service and exemplary service. Sutton has trained thousands of U.S. law enforcement officers and is the author of True Blue: Police Stories by Those who Have Lived Them, A Cop’s Life: True Stories from the Heart Behind the Badge, True Blue: To Protect and Serve and The Power of Legacy: Personal Heroes of America’s Most Inspiring People. Reach him via his website at www.thepoweroflegacy.com.